The original owner was Charles Trick Currelly, part of the family that founded the Royal Ontario Museum. 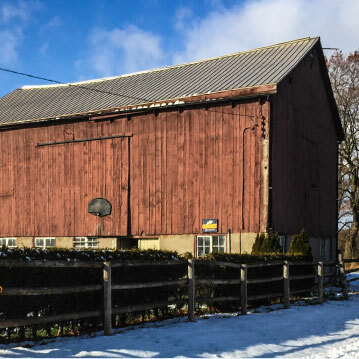 This bank barn was first built in 1917 and added to in 1927 for cattle. 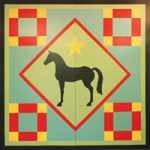 Now used for an equestrian operation, the quilt board shows a diamond paddock surrounding the horse while the star represents the hero in “North Hero Farm.” Painted in each corner of the quilt board are the stalls where the owner keeps the horses that she breeds, trains and boards.